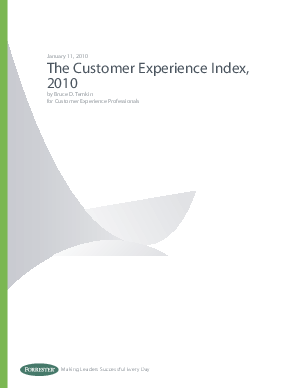 Forrester asked more than 4,600 US consumers about their interactions with a variety of companies, gauging the usefulness, ease of use, and enjoyability of those experiences. Based on these consumer responses, we calculated the Customer Experience Index (CxPi) for 133 firms in 14 different industries. Barnes & Noble, Marriott Hotels & Resorts, and Hampton Inn/Suites topped the rankings, while Charter Communications took the bottom spot for the third year in a row. Only 13 of the firms wound up with “excellent” ratings — and 45 were “poor” or “very poor.” At an industry level, retailers, hotels, and parcel shipping firms ended in the top spots for all categories, while health insurance plans, TV service providers, and Internet service providers ended up at the bottom. Led by Liberty Mutual Insurance, Comfort Inn, Sprint, and Time Warner Cable, 22 companies made significant improvements over last year’s results. There’s a lot of opportunity for companies to drive better business results by improving their customer experience management efforts. How? By charting a course toward Experience-Based Differentiation (EBD).